As the list of available abilities grows, we have to create a system that allows the user to personalize their set of abilities. We also take a look at another new ability: Ice Roots. You'll be able to pick 6 abilities for your loadout. These will be the only abilities you can cast during the game, so pick wisely! Of course, you can customize your loadout between games. Currently, we have 7 abilities, so you'll only have to leave out one. That choice will get harder as we make more, though. 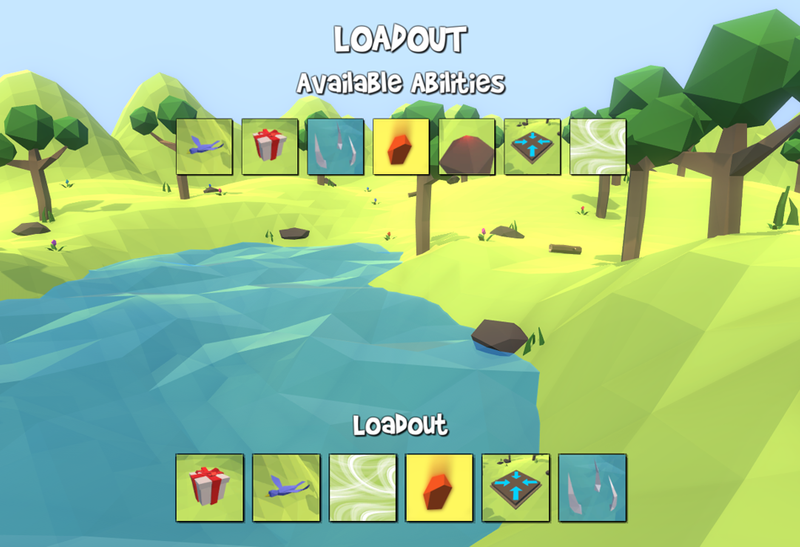 The Loadout System allows for the player to strategically compose their set of abilities. As you won't be able to just choose all abilities, you'll want to pick a set of spells that work well together. For example, crowd control abilities (such as the Tropical Wagtail or the new Ice Roots), make it easier to hit Meteors, and harder to dodge Wind Gust. As time progresses and the account system gets added, we will introduce account levels, so newer abilities will be unlocked by gaining experience. Tactical usage, such as blocking a player from reaching a checkpoint, or removing a platform under a series of obstacles, will be the main idea behind Bamboozle Platform. Runners won't have the time to deal with a disappearing platform when they are already busy dodging other obstacles, and that's exactly why you'll cast the ability. Accompanying the Loadout System, is a new ability. Ice roots forms, you guessed it, ice roots around every player. After a small delay, any player that is not in the air will be snared and will take damage. Ice Roots is quite easy to avoid when you get the hang of jumping when it appears. However, since the counterplay is simple, the penalty for not dodging it is quite high. The snare lasts a long time (in addition to dealing some damage), making it very easy for the Leader to hit followup abilities. We'd also like to remind you that our discord server is up, so if you have any questions, or are interested in alpha testing, please come and take look! You can join our server by following this link: https://discord.gg/T3gUgpm. See you there! Next week is a big one. That's all we're saying.